With the recent addition of a powerwall to my workshop, I’ve been running everything I can from it. That includes my 3D printer. 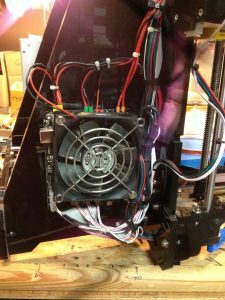 I wanted to have dual power sources for and be able to switch between mid-print, so I could use an AC adapter for overnight prints, and could print from the battery during the day while I can monitor it (I do not have a BMS installed yet – I bought a 7 cell monitor with 50mA balance that I will eventually install). Before jumping in to that, I figured I should clean up the wiring. I used a 3 position switch to switch between AC power, Battery power, and OFF. 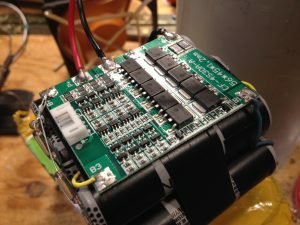 When switching from AC to battery I used a supercapacitor bank to power the board for the few milliseconds while the contact switches position. 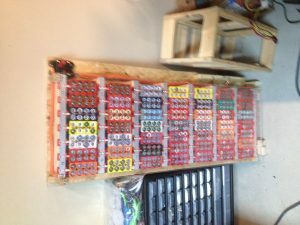 The supercapacitor module I used has 6 2.7V 100F supercapacitors connected to a overvoltage protection board. 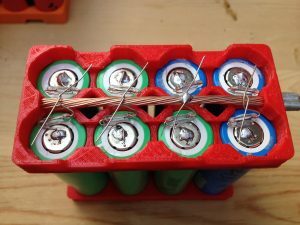 I could have used some batteries for this, but supercapacitors work very well and charging/discharging batteries properly would have been more complicated, heavier, and less appealing. 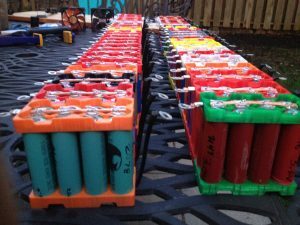 Charging the supercapacitors could have been achieved just connected directly to 12V, but if they are dead to start it would draw a huge current and charge up very quickly which is usually the good side of supercapacitors. However, the problem with this is overcharging and staying balanced. 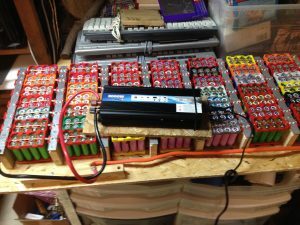 The charging current would also be too much for the 12V 20A power supply, and the voltage would probably drop too much. Being chinese parts, I did not trust that the supercapacitors that I used would be balanced, so I decided to limit the charging current to 1A with a 10ohm resistor in series with the supercapacitors. This resistor would also limit the discharge current of the supercapacitor bank, which I did not want – so a 20A diode in parallel with the resistor was added to be able to discharge the pack at up to 20A. 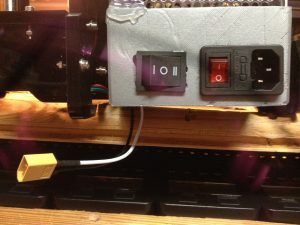 I also added a switch inline with the capacitor bank to connect or disconnect it from the 12V system. 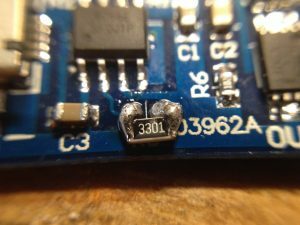 This will hopefully put less wear on the supercapacitors and let them last longer (especially considering I do not think they will last too long being chinese parts – one was already dead out of the box). 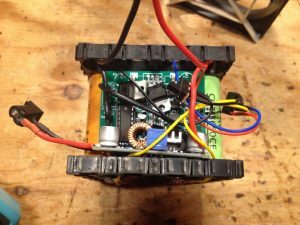 The other reason for adding the resistor in limiting the charge current was to completely eliminate any chance of the supercapacitors overcharging. 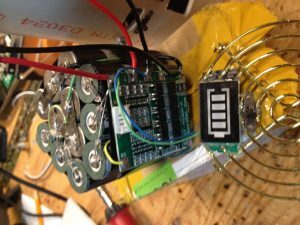 The bleed resistors on the supercapacitor board can keep the cells under 2.7V while they are being charged at 1A. An XT-60 connector was used for the battery connector. 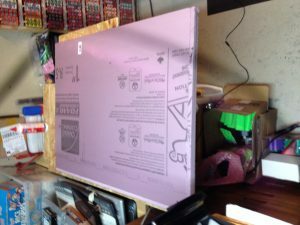 One issue I have found is the converting my 24VDC powerwall to 12VDC cheaply, and transmitting 20A current over almost 12 ft from my powerwall to my printer. 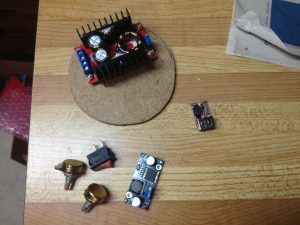 I have a few different models of DC-DC buck converters on order, and will test them out once they arrive – the one that I currently have has too much of a voltage drop when drawing 20A, and the printer shuts down. This has been a fun project, and it was amazing when it worked on the first try (powered from a smaller 12V battery). My 2.4kWh powerwall is finally complete! Printing the holders took a long time to do, and I thankfully had a friend help out with the printing. I had to print out almost 100 holders, using just over a full roll of filament. 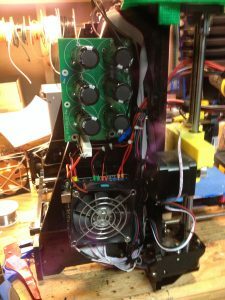 Then came the brunt of the work – making over 1500 solder connections for this build (It took a while). 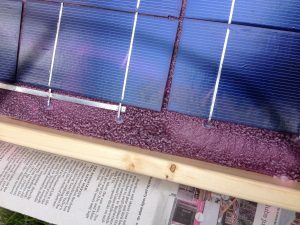 I did most of the soldering outside because there is much better ventilation, and the weather was nice, so why not take advantage of it? The positive end of each cell was soldered to a 4A fuse. I chose 4A, as this power wall was also designed to be able to run an electric car that I worked on for the Waterloo EV Challenge with the EVPioneers. and needed to be able to supply 150A burst current. 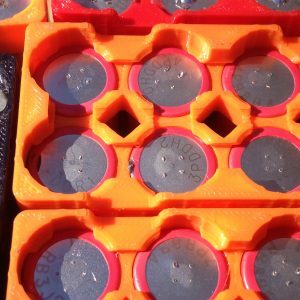 I only had enough 2A and 4A fuses, and the 2A would not give me enough power. 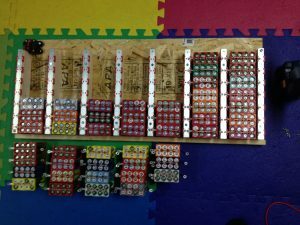 For use as a power wall, I would recommend using 1 or 2A fuses because it will keep the cells within reasonable operating limits. Yes, most cells when new can do 4A (2C) continuous, but after a long life in laptops, it is safer to keep them under 1C continuous. The negative end was connected to the bus bars with the extra legs of the fuse wire that were cut off from the positive end. And that brings me to the bus bars. 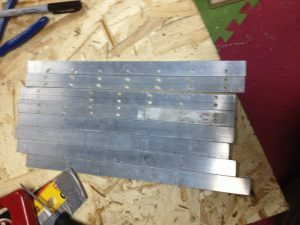 I was originally planning on using copper – either flattened copper pipes bars, but after checking prices and feasibility, I decided against it. 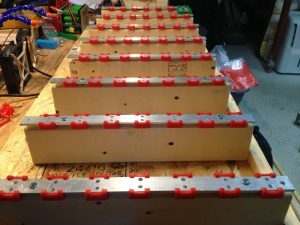 I couldn’t find an easy way to attach the 8 cell modules to the copper pipes without soldering, and comparing prices of copper bars to aluminum bars, I went for 1/8″ * 3/4″ aluminum bars. 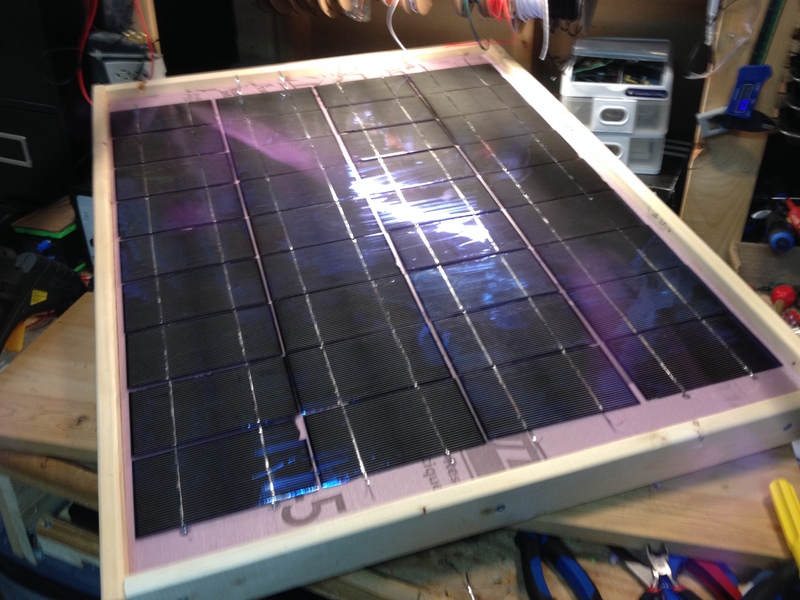 Attaching the 8 cell modules to the bars was another adventure. 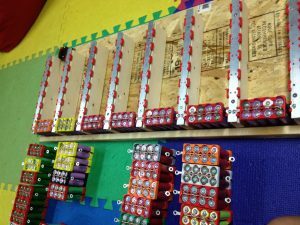 On each of the 8 cell modules, the fuses were soldered to a wire with a screw terminal on the end in order to be able to swap out the 8 cell modules without soldering. I was originally planning on using 16AWG wire for this, but after checking out the 12AWG wire that I had lying around, the 12AWG was a lot easier to strip, and would heat up less under heavy loads. On the positive end, I made the wire just slightly longer than the modules in so that they would fit in the smallest space possible, and have just enough room to crimp a screw terminal on to. The negative end got a wire that was bent up to the same level as the positive wires. I covered this longer wire with heat shrink as much as possible, 3 separate sizes to prevent it shorting out where the positive end just pokes out the end opposite of its screw terminal. 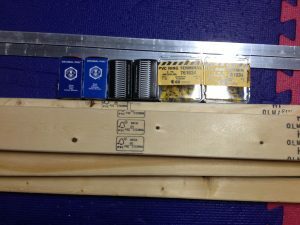 Now for actually getting these parts – a $70 trip to the hardware store later, I came back with 8ft of aluminum, 100 12AWG screw terminals, 200 6-32 nuts and bolts (they were the cheapest), and some wood for the frame. 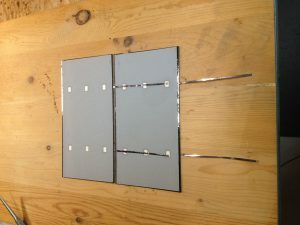 I cut the aluminum into 1ft lengths, then drilled lots of holes in it for mounting the aluminum to the frame of the power wall, and for the screw terminals to attach to. 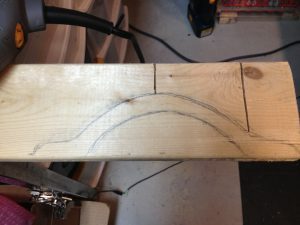 I did not want to have to get out a pair of pliers to hold the nuts in place and risk shorting something out when screwing the packs on to the bus bars, and I had recently seen Adam Welch make some captive nuts on his solar shed bus bars. 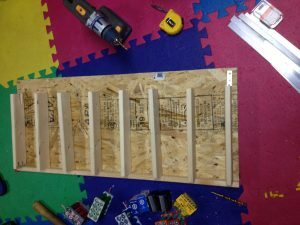 So I designed a similar system that will hold 2 nuts. 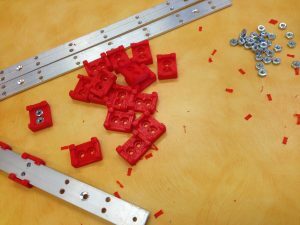 After printing out 56 of them, I started putting the nuts in, and sliding them on to the aluminum bus bars. The frame of this power wall is made out of wood. I really should have used something non-flammable to mount everything to, but I could not find a metal cabinet or something similar in the right size. I also didn’t want to spend $150 on an enclosure, so wood it is. With all the testing I have done on these cells, and individually fusing each one, I do not think there will be any problems. I will be constantly monitor this looking for heaters, and checking voltages. 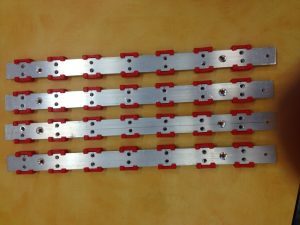 Each parallel group is separated with a piece of 1×3, which I mounted the aluminum bus bars on top of. Once all 8 bus bars were mounted, I started adding the packs in, balancing capacities as best I could while at it. I used an impact driver to tighten all the screws – I had previously replaced the aging NiCad in the impact driver with 18650s, and it’s still working great. 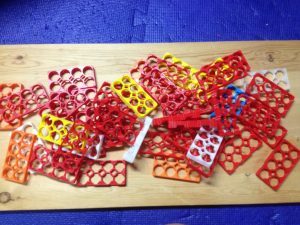 I did run in to one 3D printed holder that I stripped, but thankfully it was at the end of one of the bus bars, so it was an easy replacement. 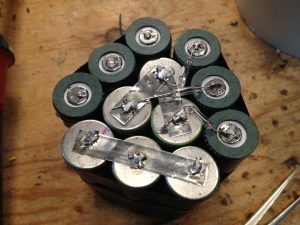 To finish up, I added a 150A circuit breaker to the positive end, and added a 1/4″ clear acrylic sheet over the top of the batteries to prevent any shorts. 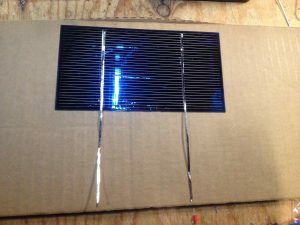 The inverter I used for this is a 1000W modified sine wave inverter. It was one of the cheapest ones on Amazon, and that would probably be the one component I would change if I did do this again. On the other hand, pretty much my whole workshop is powered with DC, so it’s not too big of a problem. I do like it though, because it heats up my 60W AC soldering iron better than the house AC. My regular soldering iron – a Hakko T12 clone – is powered with DC, as well as my lights, and I will eventually add my 3D Printer to that list as well. I have yet to stress this battery out, or do a proper capacity test, but so far, it’s been amazing. The inspiration for this project came from trying to repair the bike computer that I had originally. 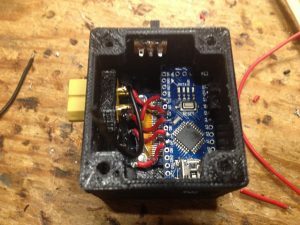 I lost the base for it, and figured I could print a new base, and given that there were only 2 contact points for the magnetic sensor, I figured that it had to be a reed switch. So I held the 2 leads of a reed switch to the 2 contact points, while moving it over a magnet, and sure enough, my assumption was correct. At this point, I knew what I had to do to fix the bike computer I had now, but there were still a few things I didn’t like about it – current speed was not available, and it had too many other metrics that I don’t care about. The only logical solution was to build my own custom bike computer. 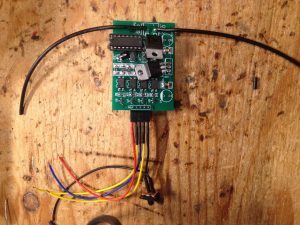 Breadboarding the circuit with an Arduino, an OLED, and a reed swith connected to an external interrupt capable pin (D2 or D3 on the Uno, Nano) of the Arduino was simple. Figuring out the proper calculation to get from number of rotations per millisecond to kilometers per hour was a little trickier than expected. I did easily find one online, but wanted to see if I could come up with the same result. 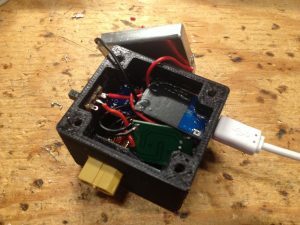 With the basic circuit and programming complete, I started to design an enclosure for it in Fusion 360. The enclosure mounts to the bike through a separate piece which is zip-tied to the handlebars. The reed switch is will be permanently mounted to the bike (again with zip ties) to the fork. 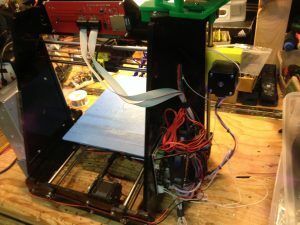 To connect the permanently mounted reed switch and the removable Arduino parts, I used an XT-60 connector. It’s only electrical purpose is to pass the signal from the reed switch to the Arduino, but it also holds the removable part in place. I could have accomplished the same thing with some dupont-style 2.54mm pin headers and designed a clip on to the model, but I went the route of XT-60 connectors because I felt it was easier. In the removable part of the bike computer, I had to fit an Arduino nano, an OLED, a sliding power switch, 4 push buttons for menu navigation, the XT-60 connector, as well as a li-ion battery, a TP4056 charge and protection board, and a 5V boost converter. It was a tight fit, but I managed to get everything in. 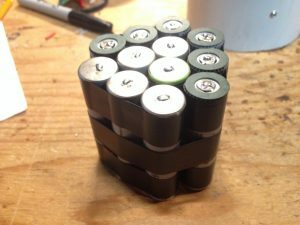 The battery I used for this build is not the typical 18650 that I have in so many other projects, as that would have required the enclosure to be a lot bigger. For this project, I took a cell from an old cell phone that I got from an electronics recycling, removed the plastic casing and protection circuit, tested the voltage (it was around 2.7V), and charged it up. 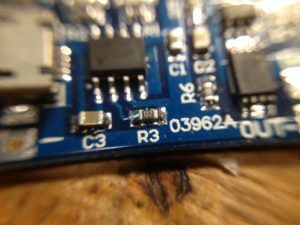 The cell was rated at 895mAh, and the TP4056 modules are pre-set to charge at 1A, which would be just over 1C for this cell, I decided to change the charging resistor on the TP4056 board. 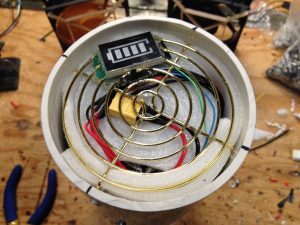 I could have done this with a soldering iron and a fine tip, but given that I recently got a hot air rework station, I figured now would be a good time to use it. Typically, Li-ion cells can be charged at 1C, but given that this cell was used and sitting at under 3V for a few years, I decided to go for a 0.5C (roughly 500ma) charge rate. The appropriate resistor for that would be around 2.5K ohm, but the closest bigger resistor that I had was 3.3K, which worked out to roughly a 350mA charge rate. I replaced the resistor, and charged it up without issue. 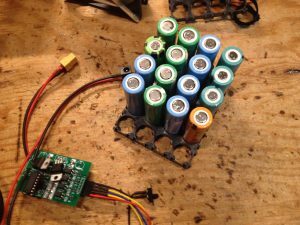 The battery got connected directly to the BAT+ and BAT- pads of the TP4056 module. 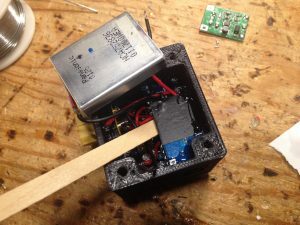 The OUT+ of the TP4056 gets connected to one side of the power switch, while the other side is connected to IN+ of the boost converter. OUT- of the TP4056 is connected directly to IN- of the boost converter. The boost converter output was originally a USB type A port, which I removed, and soldered wires directly to the 5V and GND pads on the PCB (the outer 2 pins of the USB connector). They are not labelled, but the GND pad is directly connected to IN-, so I got my multimeter out to check continuity. Once I had that figured out, I connected the wires to 5V and GND on the Arduino. All the buttons got connected one side to GND and the other side to a digital pin, declared as INPUT_PULLUP in the code. It was a very tight fit getting the Arduino into the enclosure. While putting it in the first time, I dislodged one of the SMD capacitors on the back of the board. I soldered it back without issue, but then it would not accept uploading a program to it. Most likely, I also damaged some of the traces going to the capacitor, but I’m not sure. I replaced the Arduino, and got everything properly mounted in the enclosure. 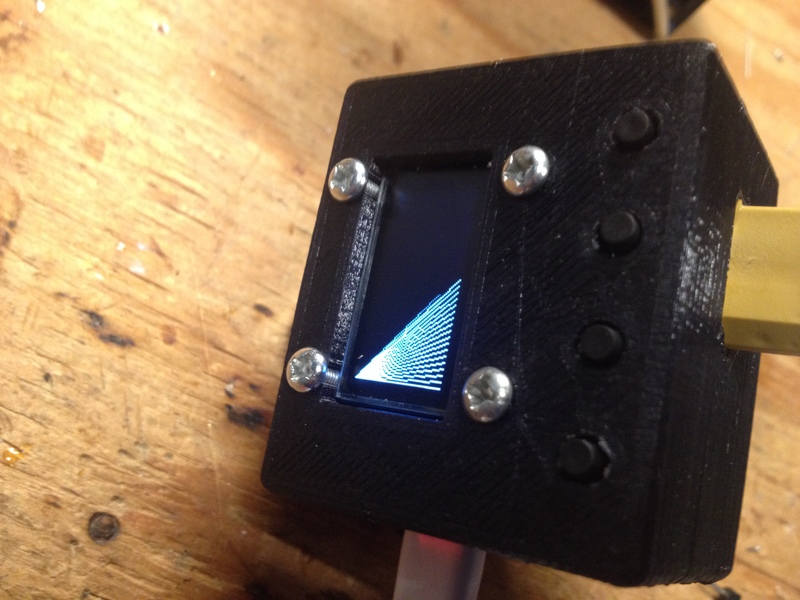 I soldered the OLED to the Arduino before screwing it in to the enclosure with 4 M3 screws. Then the Nano went it next, secured with friction for now. I put the XT-60 connectors in both parts of the mount, and secured them with two-component adhesive, which I also used to secure the Arduino at this point, and the power switch. After soldering the 4 push buttons for menu navigation to the Arduino, they got glued in with a generous amount of hot glue. The TP4056 module went in directly on top of the Arduino, the boost converter slid in behind the switches, and the battery fit over top of everything. I’m sure I could have made the wiring more elegant, but it would have taken much more time. Overall, this accomplished exactly what I wanted it to do – get me information on current speed, and distance travelled while riding my bike. I also added in some functionality to track trips, and save up to 10 of them in EEPROM memory. Back for round 2 of my 100W LED flashlights. I enjoyed the first one such much and used it enough that I decided to build another that solved a few of the annoying problems with that one (terrible battery life, constantly monitoring battery voltage, battery outside the main casing). I’ve been thinking of building this for a few months now, and from the time finally decided to go ahead and make it, it took me around 8 hours of work on it to complete it. 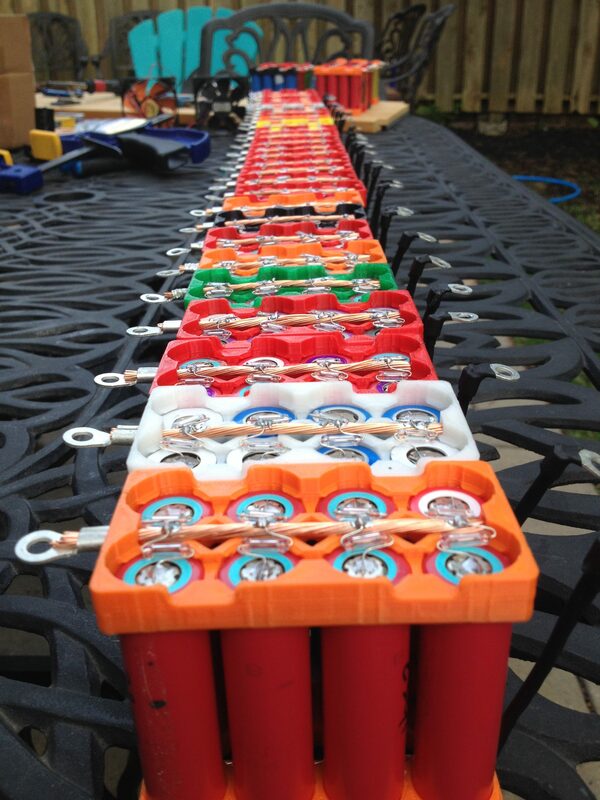 That includes making the custom battery, testing all the parts, and choosing resistor values. Let’s start out with the choice of parts. 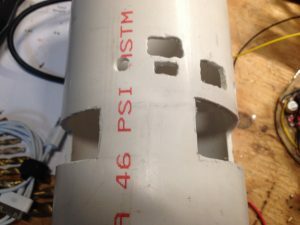 I mounted everything inside a 4″ PVC pipe because I had seen it done before (link), and it is much sturdier than the MDF I used for the original. As for a heatsink, I had to find one that fit inside the 4″ pipe. A stock Intel CPU cooler is perfect for this. For the control circuitry, I used pretty much the same parts as the last one – a 150W boost converter, an XL6009 Buck Boost converter, 2 potentiometer, and I also added an extra switch and USB buck converter to have a USB charging port. 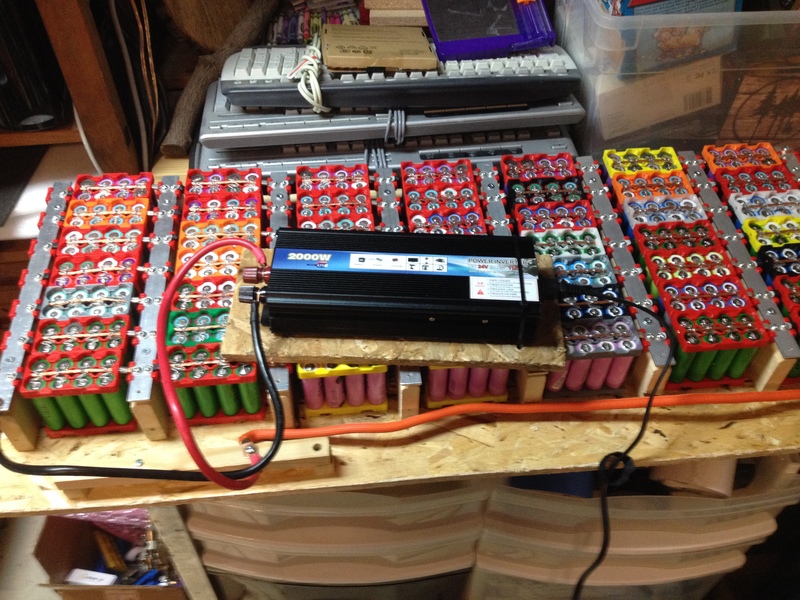 The batteries I used are 12 Grey Panasonic NCR18650 from old laptops, all around 2800mAh. 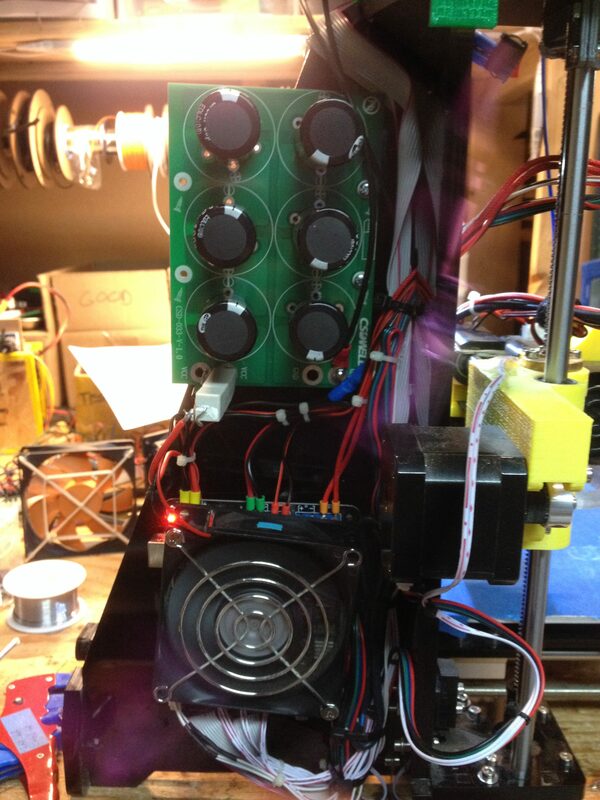 The BMS is a 4S 30A BMS from aliexpress, and works perfectly, as far as I can tell. I added a voltage monitor to the back of the flashlight as well. And of course, we cannot forget the 100W LED, and accompanying lens. I used M3 nut and bolts for all the attachments, as I have plenty of them lying around, and they are very common. 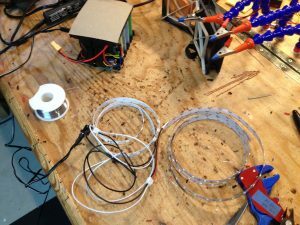 Starting with the control circuitry, I used a rotary tool to cut out a circle of MDF slightly smaller than the inner diameter of the PVC pipe to mount all the electronics to. 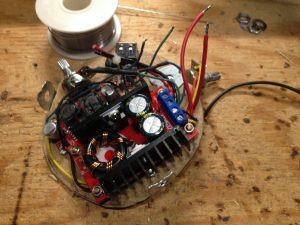 The boost converter is being used to boost the voltage of the battery pack up to a maximum of 32V for the LED. Anything higher than that, and the LED will start to draw too much current, heat up, and possibly explode due in incorrectly matched diodes. If you want to find out more about why this happens, check out BigClives’s video on it. 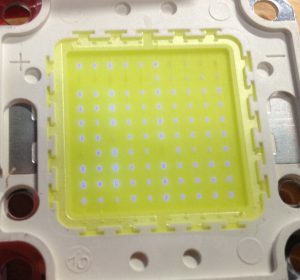 Always be sure to know what you are doing when playing around with high power chinese LEDs. The original potentiometer on the boost converter is a 10K trimpot, but that obviously had to come off if we were going to be able to adjust the brightness form the outside of the case. I started out with a 10K potentiometer, and figured out what resistance caused a maximum voltage of 32V, which turned out to be around 9K. I used a 5K potentiometer in series with a 4K of resistors to max out the voltage at 32V, but still have an adjustable voltage. 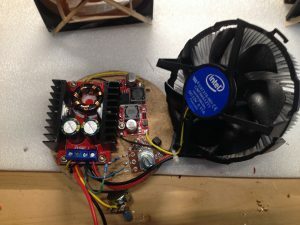 I also wanted to be able to control the fan speed, so I did the same procedure for the XL6009 buck boost converter, max voltage of 14V to overvolt the 12V cooling fan to give maximum cooling performance. I feared that the small intel heatsink would not be enough to properly cool the 100W LED at full brightness for very long. It turns out that the stock Intel fan has a built-in speed controller, so this turned out to be useless, but I did fry one fan while figring this out. 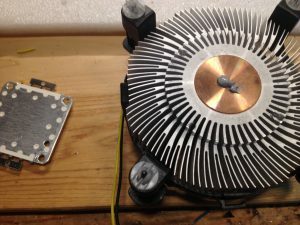 While testing the buck boost converter for the fan a potentiometer failed, and created infinite resistance between the wiper and the edges. This triggered the buck boost converter to boost to its maximum voltage which turned out to be over 60V. This let the magic smoke of the stock Intel fan, so I had to grab another from my bin, but I didn’t put it back in circuit until I had replace the potentiometer and tested the voltage numerous times on the output. I was surprised that the buck boost converter went up to such a high voltage, since its max adjustable output voltage is around 35V, the same as the capacitors are rated for. 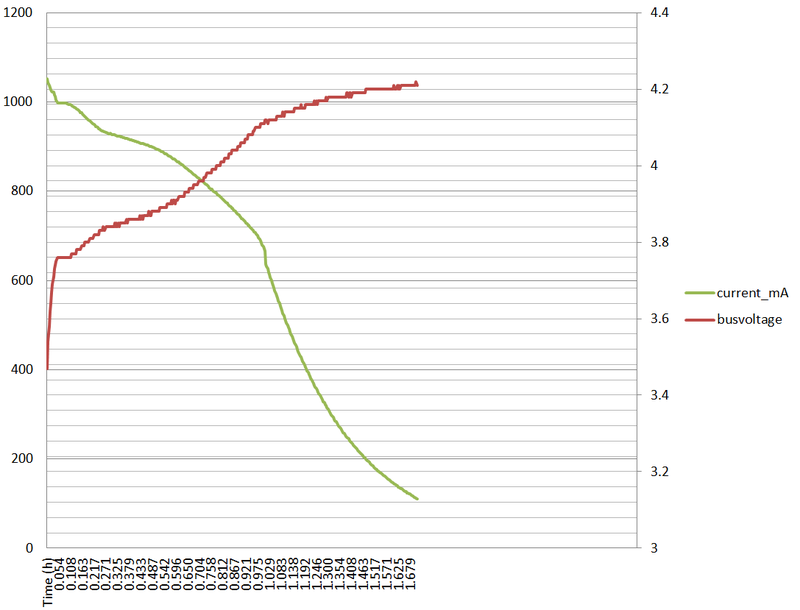 I’m glad (and surprised) I didn’t blow any of the capacitors, pushing 25V over their limit through them. Just another example of chinese engineering. If I had not caught this before I mounted it, the capacitors would have been taking that 60V for a much longer time before I realized what had happened, and most likely would have blown. The USB Buck converter was also added with its own switch, and required no special wiring. Interestingly, there are no markings on the board to mark input polarity, so I got out my multimeter and testing for continuity between an input pad and the grounded USB shroud. 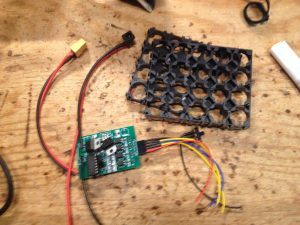 One quick note – controlling these LEDs with a voltage limit is not the proper way to do it. 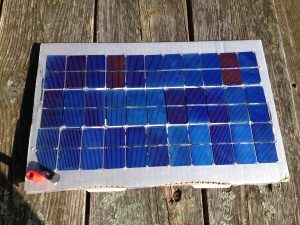 A current limiting circuit is much better, and will prevent the LEDs from burning no matter what the voltage is. They are much more expensive though, so I am sticking to voltage control, but limiting it below the max voltage. 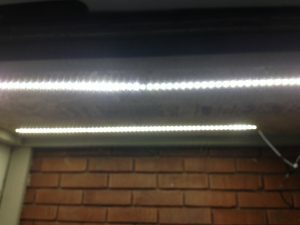 These LEDs can take up to a maximum of 36 volts (I believe) if properly controlled with a current-limiting device. 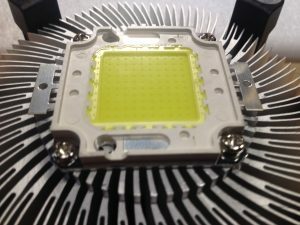 I would highly recommend not driving chinese LEDs at their maximum specs, as that increases the chances of danger (again, see Big Clive’s video that explains much better why this is dangerous). 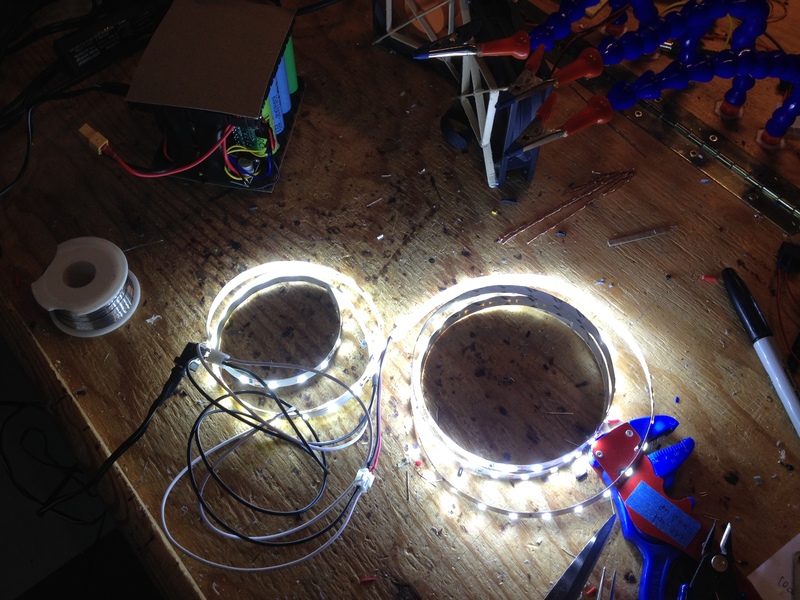 I tested my LEDs, to make sure that they were not too far out of balance with each other. As you can see from the picture below, mine were matched fairly well – much better than the ones shown in Big Clive’s video. 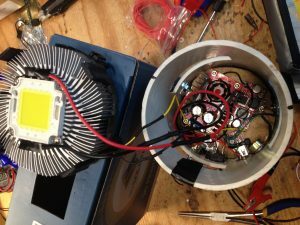 I am driving my LEDs at a max of roughly 33V. 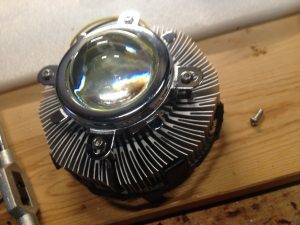 To attach the LED and lens to the heatsink, I drilled 8 holes around the center, one set of 4 to fit the LED and the other set of 4 to fit the lens mounting points. I used M3 screws, and they tapped themselves into the aluminum very well. Before screwing the LED down, I put a blob of thermal compound in the middle of the heatsink. Same procedure as CPU mounting CPU coolers to a CPU. 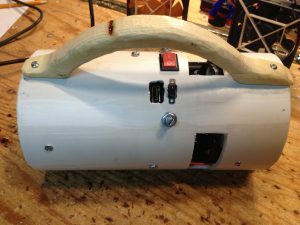 Once I got all the control electronics figured out, I went on to cutting the PVC pipe and mounting everything to it. I drilled holes for the potentiometers, switches, and screws, then went outside to use a rotary tool to cut out the ventilation holes, cut the tube to length, and enlarge some of the drilled holes. It is very important to do this is a well ventilated area, and ideally use a face mask to avoid breathing in the PVC dust. Using some 6-32 screws, washers, and some galvanized strapping, I created a mount for the MDF control board, and then mounted it in the pipe. After soldering the LED to the output and verifying that it worked, I put that inside the pipe as well, and drilled 2 holes through the plastic fan mount in order to attach it to the PVC pipe with some M3 screws. 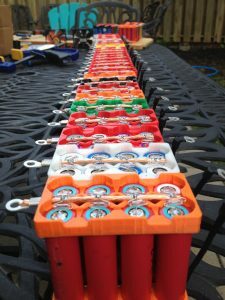 Next I worked on building and mounting the custom battery. As I mentioned earlier, the battery is a 4S3P configuration, made up of Panasonic NCR18650 cells from old laptops, all around 2800mAh. 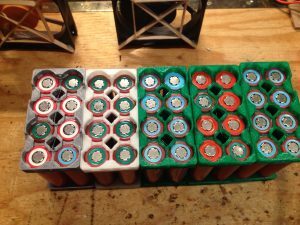 Each cell is individually fused on the positive end with a 3A fuse, and the negative ends were soldered together with nickel strips. The BMS output is connected to the input of the boost converter for the LED, and the buck converter for the USB port. I also added an extra XT-60 connector to the main terminals of the battery, as well as a balancing harness in order to be able to charge the battery with a hobby charger. 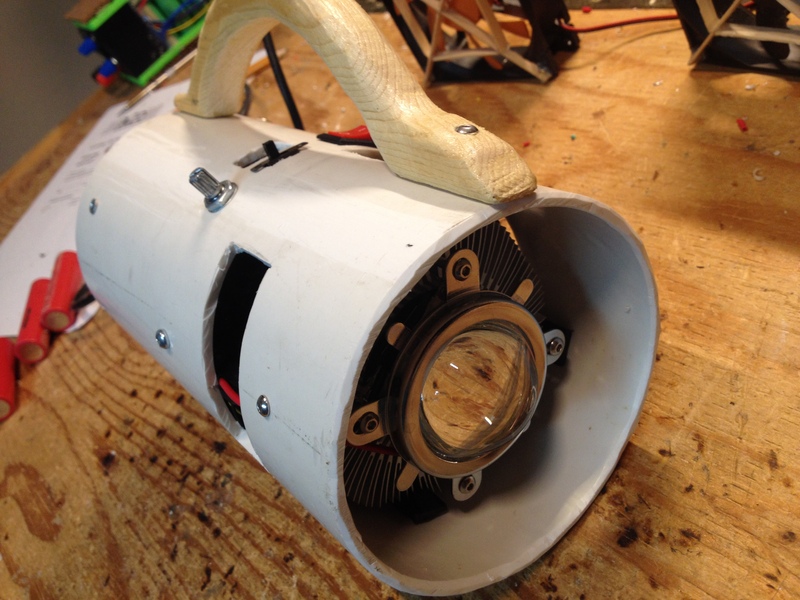 I put a piece of foam in the back end of the flashlight to cover all the screw heads on the MDF board, wrapped the battery in 2 layers of foam, then put the battery in and another piece of foam on top. 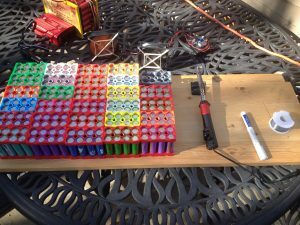 Packing the battery with foam is definitely not the best for heat, but I do not anticipate it to be a problem. These battries can supply a max of roughyl 15A, and I will only be drawing about 4A. To keep it from falling out the back, I added another piece of foam, and put an 80mm fan grill on top. I cut out part of the fan grill in order to put a 4S voltage monitor and a switch to have a rough idea of the battery level without any hassle. The screw holes in the fan grill were bent downwards and pushed around the outside of the foam so that 4 computer fan screws could be screwed in to PVC where I had previously drilled holes, and hold the fan grill in place. All the was left to do was add a handle, so I cut a rough shape out of a piece of 1×4 with a jigsaw, then sanded it down with a rotary tool, and drilled a hole in either end of the flashlight and the handle to mount it securely. I added a layer of clear gloss acrylic spray paint to the handle to give it a bit of protection against moisture. 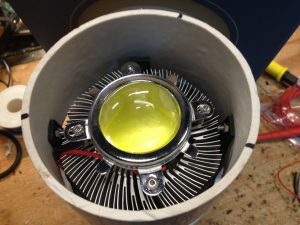 With that, my second 100W LED flashlight was complete! 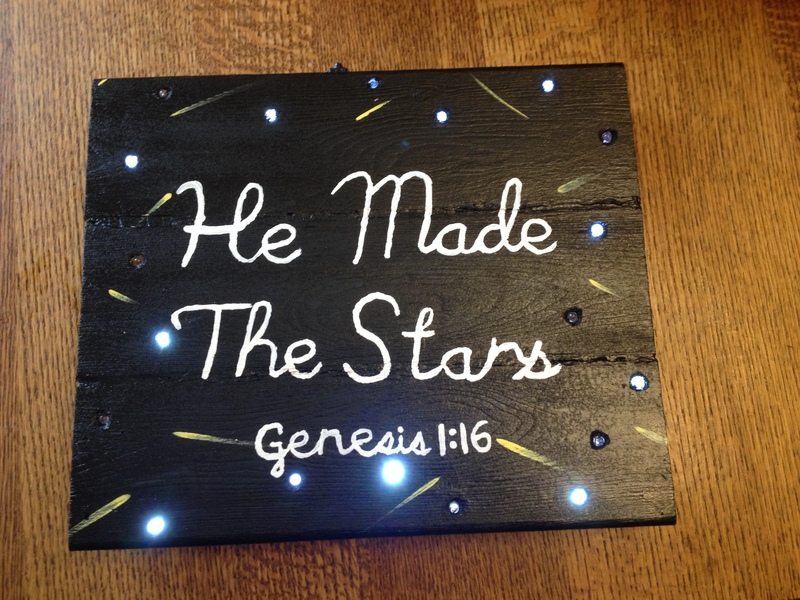 If you want to see the first one, you can check it out here. I like this one much better, as it is all in one self-contained unit, therefore is much easier to use and handle than the previous one. I recently built another flashing LED sign and wanted to post some pictures of it, so here they are. Building this one followed a very similar process to the rest (linked below), but this time it worked on the first test! Check out the original builds and instructions here.